In this article, you will see some words in blue. I explain the meaning of those words at the end of this article, in the vocabulary section. Yesterday, in London, England, there was a very important football match. 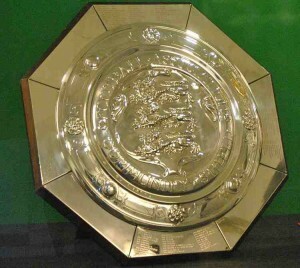 The name of the match is the Community Shield. The Community Shield is an annual football match which is played the week before the start of the new English Premier League season. All the money from the game is donated to charities. The champions of the Premier League from the previous season. The winners of the FA cup from the previous season. Last season (2014-2015), Chelsea won the Premier League and Arsenal won the FA cup, so yesterday’s match was between Chelsea and Arsenal. These are both clubs from London and they are big rivals. The match took place at Wembley stadium, which is the national football stadium in England used for cup finals and other important matches. Arsenal won the game 1-0 with an excellent goal from Alex Oxlade-Chamberlain in the first half. This is the first time that the manager of Arsenal (Arsène Wenger) has beaten the manager of Chelsea (José Mourinho) in over 11 years. The managers don’t really like each other! At the end of the game, the managers did not shake hands. Some journalists believe that Arsène Wenger snubbed José Mourinho because Mourinho has often insulted Wenger in the past. Next week, the English Premier League season starts and I am sure there will be more drama between these 2 managers during the new season! If an event is annual, it means that it happens every year. Example: Christmas is an annual festival. = Something that happens or exists BEFORE the one mentioned. Example: My new car is red. My previous car was blue. = to ignore somebody. To NOT give somebody any attention. To act like the person is not there. To act like the person is not important. For example: Mark is at a party and he sees a friend from school called David. David is talking to a girl. Mark says hello to David but David does not reply. David continues to talk to the girl. David has SNUBBED Mark. Thank You very much Guy. By the way, I’m Dzung. I’m a new comer and I come from VietNam. First of all, I want to say Thank You cos’ of your amazing lesson on youtube and your web. I enjoy learning it and it’s really helpful. It’s blew my mind. Please keep it up guys. Yeah man, I’m a huge fan of English football. I love English football and Arsenal is my favourite foodball team. I love English and try to get close to your culture. I try to learn it everyday and anytime I can. iam suliaman from yemen,iam engoying with chanel ,i hope learn english very well. Yeah. I really like English Football, because everyone can win in league matches. For example: Chelsea can lose with the last team in the table. Another example: Leicester City-nothing to say. They are playing amazing! I’m learnnig English and the articles are very goog. I like English football but I didn’t watch the match. Wenger and Mourinho are excellents managers.